Rockstar Energy Suzuki’s Kevin Strijbos put in a hard-fought-for podium position and comeback in today’s second race of the World MXGP Championship in Finland from the back of the field after a poor start. The Grand Prix of Finland, in the shallow and stony sand of Hyvinkää, was the setting of the 2014 FIM Motocross World Championship’s 13th round of 17 and saw the Belgian defy fatigue and mediocre starts to surge to his sixth podium result of the year across one of the most difficult tracks seen so far on the calendar. 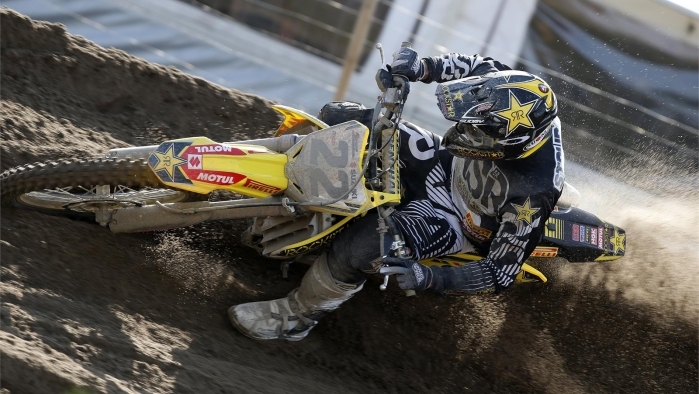 The Belgian used his works RM-Z450 Suzuki to place fifth and fourth in two motos - run in cloudy and warm conditions - and in front of 17,000 spectators. Strijbos was alone in the Suzuki awning this weekend after team-mate Clement Desalle was unable to travel to Finland in the wake of pain and the repercussions of his start-straight crash in the second moto in Sweden the previous weekend. The ‘#22’ altered the setting of his race bike on Sunday after an unsuccessful experimentation with suspension on Saturday and seventh spot in the qualification heat. On Sunday afternoon Strijbos didn’t make the best of starts in the first moto and then couldn’t forge much of a difference to the rear wheel of Max Nagl; eventually crossing the finish line over five seconds behind the German. In the second moto – and after having altered his set-up again, reverting back to the set-up used when last in the sand in Valkenswaard – he unveiled an astonishing performance: He completely fluffed his getaway from the line and was down in 22nd position on the first lap. From there he conserved his energy and ploughed a course all the way back to fourth position, almost nicking third from Shaun Simpson on the final corner. With 13 rounds now chalked-off the calendar Desalle is third in the MXGP standings with Strijbos 46 points behind in fourth. After back-to-back trips to northern Europe the FIM series now takes a break. Round 14 will take place on July 27th across the hard-pack of Loket for the Grand Prix of Czech Republic.